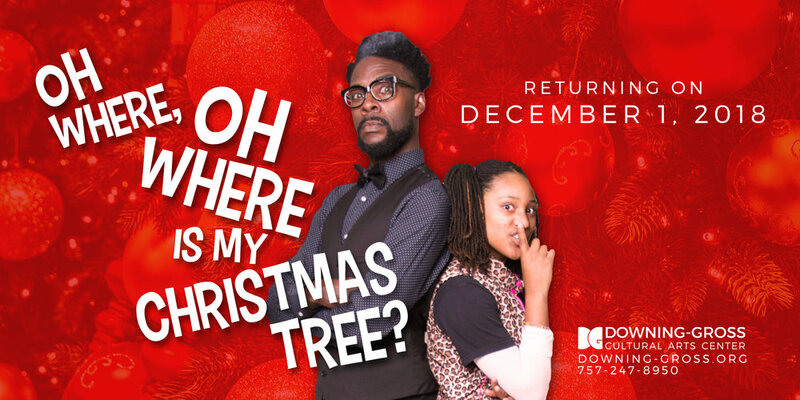 The highly requested stage play "Oh Where Oh Where Is My Christmas Tree", written and produced by K'bana Blaq, is back! Join us on December 1st, as K’Bana and friends tell a story of love, loss, and the Christmas Spirit! K'bana Blaq, a vocalist with the popular Hampton funk group The Fuzz Band, said his original idea for the play was a cross between "Annie" and Charles Dickens' "A Christmas Carol." Blaq's lead character, businessman Devon Leehart, serves as the Scrooge figure — a decided departure from Blaq's own exuberantly positive personality. The play features many talented performers including Z'yana Guyton, Dreams In Motion Dancers, Myra Smith, and many more! The score was produced by the very talented DJ A1 & Christopher Wilkes! Pre-Sale tickets will be available from October 15th until November 15th. After this, the ticket prices will increase. Be sure to grab your tickets early!